For extra credit in my recently concluded virology course, I asked students to summarize a virology finding in the style of this blog. I received many excellent submissions which I plan to post here in the coming months. In 1983, identical twin boys simultaneously received a contaminated blood transfusion immediately after birth, and were subsequently diagnosed with HIV-1. Years later, one of the twins is faring very well and has a near normal immune system, while the other is in poor health and has experienced many complications. How could the same virus, infecting two individuals at the same time, with the same genetic background, yield such different clinical courses? This unfortunate natural experiment has allowed researchers to study viral evolution while holding host genetic make-up constant. Brigham Young University Chairman of Biology Keith Crandall has studied the virus in this interesting case and recently published his findings in BMC Evolutionary Biology. Crandall’s team examined blood samples obtained from the twins when they were 15 years old. They collected nucleotide sequence data from several genes essential to the success of HIV infection, which allowed them to extrapolate rates of viral growth, recombination, and genetic diversity. They reported that the virus of the healthier twin exhibited generally higher growth rates, higher genetic diversity, and higher recombination rates than the virus of the sicker twin (2). How is this possible? Infected individuals produce an estimated 1010 new HIV virions every day, with errors occurring at a rate of about 1 per 104 nucleotides incorporated (1). These frequent point mutations are a simple starting point to explain the divergence of a once identical virus. In addition, HIV virions are capable of exchanging their genetic material with a different strain of virus via a process called recombination. Recombination is likely a random event, but has important implications for the host immune system. Part of the immune system’s response to HIV is the utilization of cytotoxic T lymphocytes (CD8+ cells), which target and kill virus-infected cells. These cells are very specific, and if a recombination event occurs, these cytotoxic cells may not be able to recognize the new viral strain as readily as the original. The immune system may adapt to the new strain, but the virus may recombine again and again, and the immune system will not be able to keep up. These recombinant strains are likely to become more prevalent through natural selection. If recombined strains are better at evading the immune system, and are therefore more detrimental to the host, does this mean they are more successful? Why would the virus that has higher genetic diversity, a growth rate, and a higher recombination rate cause less disease? Perhaps the answer lies in the immune system. Once out of the womb, these twins no longer exist in identical environments. They are exposed to different pathogens, bacteria, and microbes, all of which affect the make-up of the immune system. The healthier twin’s immune system may be better able to fight the virus, and so the virus must grow, diversify, and recombine in order to propagate the infection. In other words, because the sicker twin has a more depressed immune system, the virus is replicating with less resistance, and there is less incentive for the virus to evolve. Divergent viral evolution in the case of these monozygotic twins is likely due to random mutation and recombination events, combined with antiviral pressure from the hosts, whose immune systems are not identical at all. The photo is linked to a credit. Enlightening. Thank you for that. PS: It seems that Stanley Kubrick liked that Arbus pic too. monozygotic twins (MZ) could result from other causes as well. HIV-1 response in these MZ twins? other way round. I used to think that at least some of the damage produced by HIV infection is due to the prolonged activation of the immune system that is not capable of eliminating the pathogen. This may have produced worse complications in a twin with stronger immune response. In addition, as HIV can only replicate in activated CD4+ T cells, greater activation of the immune system produces greater viral titre and, consequently, more complications. Do you think these factors could affect the differences between the HIV-1 response in these MZ twins? Also, thank you very much for your blog, I greatly enjoy reading it. A very thoughtful commentary, however, I don’t think that this scenario is ” holding host genetic make-up constant.” Besides the epigenetic differences between monozygotic twins –a point previously raised by another commenter and in ref. 1– twins also differ in their T and B cell repertoires. During T and B cell development, recombination events at the TCR and BCR loci give raise to an incredibly diverse set of antigen specific cells; many of these specificities are unique to each twin and are the only genetic differences between monozygotic twins. Therefore, it is conceivable that the differences in the twins’ ability to control viral load is not only rooted in their epigenetic differences but also in their ability to produce HIV-specific T and B cell responses. I started working in one of the countries first AIDS hospices. I too contracted HIV in 1990. I have never had an HIV/AIDS defining illness. It has been 20 years and I have been amazed how this virus ravishes some and never seems to take hold in people such as myself. I have attended support groups, mainly due to the fear of dieing’; dieing like the residents at the hospice, horrible and terrible to witness. But then I was told that some people died from the medications, we had 10 residents die in a few years from pancreatic disorders caused from some of the pharmaceutical therapies. The reason I started working at the hospice, I was called into the office by my nursing agency, they wanted me to work a “special” case. It was the first AIDS patient any agency in Seattle attempted to staff, most of the patients were confined to hospitals then. I will never forget how they responded when I said yes, sick is “sick” isn’t it” I can’t pick and choose. Today I still have nightmares about what the medical community did to this guy, he didn’t end up dieing from AIDS, it was radiation poisoning from all the “we’ll try this” treatment. How do you suggest I stop my doctors from blaming age/environment related health issues on my HIV? I have received WORSE health care because most of them just say, “Oh, that’s typical of HIV infection”. I have had carpal tunnel syndrome since I was 13, but the doctor diagnosed me a few weeks ago with HIV neuropathy. AAAHHH! A third interpretation of this story is that mutant HIV is less robust than non-resistant “wild-type” HIV. Therefore the less-mutated HIV reproduces with greater efficiency and thus greater numbers than a more mutated HIV strain. This has been hypothesized to explain the effect that “drug vacations” have on HIV drug resistance. HIV that is resistant to protease inhibitors has been shown to be less efficient than HIV that is not resistant to protease inhibitors. There is a series of articles from 1998-200x on using evolutionary models to predict the presence of antiretroviral resistance in HIV populations within an individual. Unfortunately I don’t have the wherewithal to look it back up right now. Anybody else know the status of this model? 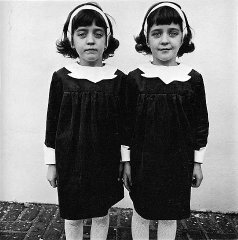 You should credit Diane Arbus for the photo of the twins on this post. This is hard to believe that identical twins would have such different immune systems. Maybe one had more nutrition in the womb than the other. Not that it matters to me, but giving attribution on a copyright infringement is not a legal defense – though it might mollify the rights holder, only if they so choose. The DMCA provides for statutory damages, so the owner doesn’t have to prove actual damages. Also, since there is a link to a book for sale, this would qualify as commercial infringement on the part of the website owner – with larger damages. That’s just a friendly head’s up, I don’t personally care either way. This is a very interesting post and it just goes to show the chance for distinct differences to take place out of a supposedly identical subject. Good health is a blessing that people should never disregard because it will be the best way for you to experience the best of life. aids and radiation poisoning are one and the same thing. i have come to that conclusion after five years of study. A.I.D.S = ATOMIC INDUCED DISEASE SYNDROME. With websites that allow you to download Pacman, now you can experience it for yourself. foot out the door, just in case things don’t work out. Companies are being set up to come up with ideas for apps and produce them for the growing market that the i – Phone has spawned. Meanwhile, Goofy wants the stone as a hood for his tractor, and Minnie wishes to have it made into a necklace. While it is certainly true that you can have a lot of fun playing Tetris, very few people realize that you can actually enhance the functionality of your mind by playing this particular game.